Seattle’s ACT and 5th Avenue Theatre join forces to produce a new and improved musical. Seattle actress Billie Wildrick is bouncing atop a trampoline, dressed up like a 1960s cheerleader in a retro blue and yellow uniform. With an all-American ponytail, she smiles and waves her pompoms. It’s part of a promotional photo shoot for Vanities: A New Musical (in which Wildrick is one of three female leads), a new production of the 2009 off-Broadway show that opens this month in Seattle. In a highly unusual move, two of the city’s prominent theaters—The 5th Avenue Theatre and A Contemporary Theatre (ACT)—are producing the show in tandem (with the show staged at ACT), sharing equal creative and logistical control. And while Wildrick may be in character, her enthusiasm is 100 percent authentic. “This collaboration is a decision to propel theater forward,” she says. ACT artistic director Kurt Beattie agrees. “It isn’t common,” he says, “but I do think it’s the wave of the future.” It also has roots in the past. The two theaters worked together informally for the 5th Avenue’s 2001 production of A Little Night Music by Stephen Sondheim. The company’s artistic directors at the time, David Armstrong of the 5th Avenue (who still holds the position) and Gordon Edelstein, were inspired by a common love for Sondheim. Staged at the 5th Avenue with ACT assisting on sets, costumes and props, the experience was deemed so positive that the two companies agreed to formally partner in the future. Armstrong first proposed a joint production of Vanities in 2009. “It was always a favorite of mine,” says Armstrong, who directed the play in college and is directing the musical now. 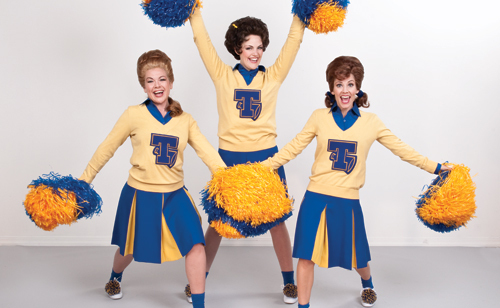 Originally written as a play by Jack Heifner in 1976, the plot follows the friendship of three Texas cheerleaders over the course of multiple decades. It became one of the longest-running off-Broadway productions in history. Heifner and composer-lyricist David Kirshenbaum began developing it as a musical in 2005, and after a few smaller productions it moved off-Broadway in 2009. With a three-person cast—Cayman Ilika, Jenny Sue Johnson and Wildrick (all Seattleites)—Vanities is ideal for ACT’s intimate 400-seat Falls Theatre. “There is a whole other world of musicals that we haven’t been able to do because they aren’t space appropriate,” says Armstrong, noting that Vanities would be dwarfed by the massive 5th Avenue stage. Wildrick, who has worked at both theaters, says she’s excited to experience the combination of the 5th Avenue’s talent for mounting big shows with the personal connection possible at ACT. Both theaters’ production and design teams collaborated on sets and costumes. Armstrong says everything down to the details of the characters’ changing hairstyles is a big undertaking, but he believes “it’s the process of collaboration that will make it stronger.” Heifner and Kirshenbaum are helping to revise the Seattle production, which will feature a brand-new opening number, additional songs and an updated conclusion that has the story ending in 1990. Armstrong and Beattie insist that the creative process has been free of drama. “It’s really a lot of fun,” says Beattie. “We’ve encountered some of those knotty logistical problems, such as combining ticketing systems, but we’ve done a great job solving them.” In a remarkable show of cooperation, the theaters are sharing a first-of-its-kind ticketing system that allows purchases from either the ACT or the 5th Avenue box office with seat availability reflected in real time. “The technical ins and outs of that is a major undertaking,” says Armstrong, who believes it’s worth the effort. Proceeds will be split according to a formula based on the percentage of subscribers each theater contributes to the audience. Both artistic directors are already planning another collaboration for 2012. “I think the intention is that, if it works, we’d like to do this on a yearly basis,” says Armstrong.